Handmade Christmas crafting activities continue in the tree-house, as we approach the fun-ness that is Christmas time. SO EXCITING! It is so lovely knowing that all the gifts we're giving have been made with love, and have contributed very little to any kinds of adverse impacts on the poor ol' planet. Lets face it, she gets a pretty rough trot at the best of times, let alone at Christmas when everybody goes crazy with consumption (and I don't mean the kind that killed John Keats). Our decorations went up the week before last, and the house has been resplendent with all manner of felt, fabric, wool and linen Christmas glory, including the super-cute '12 Days of Christmas' tea-towel, which I love so much I can't even bring myself to make anything out of it. Probably my favourite of all the decorations though, is our knitted nativity set, which, despite many people asking the question, I did NOT make, but bought on ebay a few years ago. I love it. Part of me wants to keep it out all year, but I know this would make it a bit less special (and probably quite dusty) so I limit myself to one month of the year. Why do I love it? Well... baby Jesus comes out of his manger and looks a bit like a little caterpillar, the wise men are a super-groovy in 70s-era flouro colours and they all have totally hot, giant knitted beards, and the sheep don't really stand up by themselves unless they're leaning on something. This, for me, is the true spirit of Christmas. Our Christmas tree this year is a liberated-from-work Tuckeroo, which has been decorated with an array of home-made felt danglies. It was looking fab for the first week or so, even putting on some new growth at the top, but then I noticed that the new growth had turned to sticks, and that there was a pair of ever-fattening caterpillars chowing down on the top of the tree! I promptly picked them off and fed them to the chickens (Happy Christmas girls! ), but the tree never quite recovered. Only a few more days 'till boxing day, then we'll plant it. I love having a real-life tree that then gets planted. It's like a Christmas present to the Earth. Yes, I am a hippy. In other, equally exciting news, I have finally acquired an adjustable dressmaker's mannequin. Mum got her for me, after placing a wanted ad in the trusty ol' Illawarra Mercury (who says it's a mockery!? ), and, after I finally got the hang of making the adjustments (she's an old-fashioned lady, with wing-nut adjustments, none of this new-fangled twisty-knob business) I was off and away. Thanks Mummy! Her name is Florence, and I used her for the first time today. She's amazing! My dressmaking experience was totally revolutionised! The dress is question was a custom frock for a woman I know who has probs, like so many women, finding dresses that fit her perfectly. Pearl & Elspeth & Florence to the rescue! The black fabric is a lovely heavyweight cotton/lycra jersey, and the neck (yay square neck!) and belt are from yep, you guessed it, a vintage tablecloth. I'm pretty happy with how it turned out, but I have to say I'm interested to see how Florence performed, given that the woman I made it for has never actually tried it on. Eek! If it fits her, and if she lets me, I think I will have to post a picture to commemorate Florence's first success. This week in my letterbox I received a parcel. Lovingly hand-wrapped, with a bird stuck to the front, I knew it'd be good. Upon opening, I was DELIGHTED to reveal a wondrous haul of immaculate vintage linen and a handful of thoughtfully selected CDs. The sender of this most lovely and timely parcel was my friend Genna: Lismore resident, crafty lady and super-duper primo diligent vintage linen scout. Seriously, sometimes I feel like she should be on my payroll. Every time I see her she arrives, looking beautiful, with tea-towels and tablecloths in hand. And when I don't see her, they arrive in the post. Amazing! The thing about using a LOT of vintage linen is that, even with my own diligent op-shopping, I can't usually find the amount of linen I need, especially given the (slightly upsetting) 'picked over' nature of Sydney's op-shops. This is where my scouts come in. People who know me know that I love linen. I love tea-towels, I love tablecloths, and I love brightly coloured sheets. Some people, like Genna and the ever-wondrous Jay, bring me fabric-related treats in a constant, sunshiny trickle. A little fix whenever I lay my lucky eyes on them. Others, like my mum and Nana, tend towards the bulk haul: A shopping bag or garbage bag full of treats gathered all at once or in little snippets. Clare, purveyor of the Eudyptula Minor tea-towel, is a scout who provides her finds in the post, given the infrequency of our visits (alas). My little sister Meg brings me tea-towels from her travels in rural Australia (a veritable treasure trove, I assure you) and recently recruited scout Dave is also a holiday op-shopper. He spends time in the linen section while his wife Jan looks for green depression glass. Glad to provide a pastime for the reluctant op-shopper. Then there's the tea-towel 'wrapping paper'. This is a personal favourite of mine, as I have problems with the disposable nature of wrapping paper (yes, I know you can save it, but there are only so may drawers of carefully folded, yet inevitably wrinkled, wrapping paper one household can service). The tea-towel or tablecloth solves this conundrum, providing beautiful, but easily reusable wrapping media for a vast range of gift items. Just today I received a Christmas gift from first-time tea-towel scout Niki, who presented me with a set of green glass Pernod glasses (yes, she is a winner) lovingly and carefully wrapped in a mint-condition Norfolk Island tea-towel. Crazy good. I find it especially touching when friends who craft give me linen which I know they could use perfectly well themselves. Sometimes, as in the case of the Lyrebird tea-towel, the generosity is overwhelming. So, to linen scouts of all kinds, I salute you. I could not do what I do without many helping eyes and hands at op-shops across the nation. I've said it before, but I'll say it again: I reckon making a wedding frock for someone is the honour of sewing honours. Simultaneously stressful (SO bad to get it wrong) and elating (AMAZING when you get it right), the brainstorming, creating, sewing and wearing of a wedding dress is one of my favourite things. The process of working with someone to create a piece of clothing that they will love is always quite exhilarating. But when it's a wedding dress, to be worn on the day that they publicly (or sometimes privately) declare their love, is something else. I love it. Everything about it. Ok, well maybe in the case of the wren wedding dress the metres of blue net ruffle involved in the petticoat was a little bit trying, but really, the end result was unspeakably fulfilling for me. What more can I say? The dress came together after a lunch, some chit-chat, a peruse of my vintage dress patterns and old tea-towels and tablecloths. What we settled on was a neutral-coloured dress (our original plan was for some kind of organic cotton) with a blue-wren obi-style belt and a coloured petticoat and train to pick up the blue of the wren print. Ally really wanted a dress she could wear again after the wedding, so it was important not to make it look too 'wedding-y'. For this reason, the petticoat was kept separate, and the dress was made so that, if she wanted, it could be made into a skirt. From what I've heard though, she's pretty keen on it as a dress, so the separation probably isn't going to happen. Ally and Richard, the bride and groom, are spectacular people, and their wedding day looks like it was a fitting celebration of an inspiring love between two incredible people. Yay love! A new wedding dress in the pipeline - yay! I shan't say too much at this point, for fear of ruining the surprise, but lets just say I AM EXCITED (unusual, I know) because wedding frocks are beautiful, and people celebrating their love are EXTRA beautiful. I was mostly consumed with making doily bunting and embroidery-hoop pin-boards, both inspired by things I've seen in Frankie magazine. The doily bunting was actually so great that we decided to keep some for ourselves. Here it is adorning our mantel. Pearl was occupied with cutting out and sewing up shorts for some of our little friends. And lovely Louisa was doing a spectacular job of embroidering a kookaburra. Outstanding. But when the weekend was over, it was back into the P&E sweatshop (ie. our dining room) for me. It's a busy time of year for the little cottage industrialist, with gift and custom orders flying in from all directions. The rain over the last few days has afforded me some much-needed time to catch up on my Georgie Love collection, which has been sadly neglected in the wake of much custom sewing. A shipment of skirts and bibs is being sent off today, so should be up on the site in the next few days. I had had a bit of a tablecloth bonanza, so I kept these skirts pretty simple so that the linen could truly shine. I'm pretty much in love with this minty-green with huge pink flower tablecloth, which has been made into a rather lovely A-line with navy side panels. I'm sad to see it go, but also happy that it will soon be adorning some lucky lady's bottom. If you buy it, feel free to send me a photo, I always love to see my skirts out in the world, and I also like to see the ladies who wear them. The bibs are made from vintage tea-towels, are big, absorbent, and do up with velcro, so they're quick to put on and take off. They have always been a huge seller over christmas because they're quite cute, quirky AND functional. Bonus. One of the tea-towels is from Old Sydney Town, which I was pretty excited to find as it conjured strange and murky memories from my childhood of convict floggings. The bunny and very yellow duck tea-towels came from an outstanding little haul courtesy of Sally (who Loves Georgie). Perfect. Handmade Christmas is the best, chuck out the rest! For the last couple of weeks our house has been abuzz with excitement and preparations for the wedding of our lovely friends Alex and James. First, new frocks had to be made. Mine, a navy strapless number with ruffles all over the skirt, Pearl's a gorgeous blue inspired by the hessian dress in the filmclip for Megan Washington's song, Halloween. She also had a matching bolero made with one of the many many fabrics that recently arrived in our Alewives order. Olive's dress also had Alewives input, and was inspired by her 2 favourite books, The Owl and the Pussycat and Little Seed. This little dress actually made its debut last week at the Arias, but, being the current fave, was of course first pick for wedding dress-ups as well. But the thing that really kept me up late at night (no seriously, baby-related sleep deprivation has nothin' on this one) was the pair of pillowcases I decided to embroider as a wedding gift. As always, I wanted to give something handmade. But I also wanted to make something useful, and something that wouldn't take up too much (or any) space in their house. My lovely friend Louisa has a set of 4 quite stunning embroideries that her grandmother made for her when she was a child, which I've always rather coveted. They are trees. One for each season of the year. So it was decided that I would create a pair of pillowcases with seasonal tree embroidery down the edges, so that when the pillows are next to each other on the bed, the trees will all be together. Like so. Now, I am not experienced in embroidery. I've basically never done it because it always seemed like it'd take too long. Boy was I right on that front. But, it was a labour of love, and I was actually quite surprised by how well things were going after I finished the first tree, Spring, so I persevered. If I do say so myself, I reckon they're tops. We wanted to keep them, actually. Olive was particularly taken with Spring. Nothing like a billion little french-knot blossoms to impress really. I was also really kind of excited about how the trees looked from the back. I saw once, a long time ago, I do not know where, an exhibition of embroideries where real-size photos of the backs were exhibited next to the framed fabric. So I actually spent a lot of time looking at the backs of my trees as well as the fronts. It's like the patterns on the back have a mind of their own, as they're being created almost without consciousness from the embroiderer. Cool. This is the back of Summer. The wedding was spectacular, beautiful, love-filled, and delicious, just as we had anticipated. We know that Alex and James do indeed grow a love for all seasons, so it was wonderful to celebrate it. Yay! So it seems that there's a bit of a denim thing happening at the moment. In the space of a week, I've had quite a few requests come through for denim-y skirts and alas, I have none! 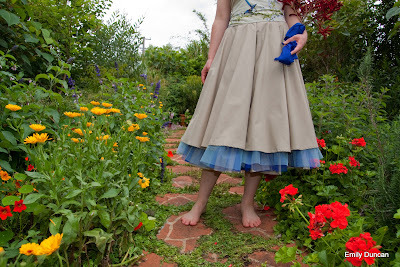 A few months ago I did get around 3 metres of lovely dark blue denim (which I made Megan's skirt and a few others from) from an op-shop, but other than that I hardly ever find it. Which is unfortunate for a few reasons, not least of all it is SO FUN to work with, and it seems that at the moment people are just busting for denim A-lines. What to do? Well, I'm not one to deny people their sartorial urges so I've decided to just go out and buy some. New. Shock horror. I generally try to avoid buying fabric new mostly because I think it's far more interesting to work with second-hand stuff. Weird shapes and sizes force creativity, generate excellent colour combinations and are just more exciting than your average, bought-off-the-roll fabrics from Spotlight. Of course, it's also better for the planet to re-use, duh, and using second-hand fabrics gives me an infallible excuse to satisfy my op-shopping addiction which is both genetically propelled and remarkably insatiable. So the bought-new denim is somewhat of a challenge for me, but hey, the skirts are fun and who am I to say what people can and can't have? So I made this cutey-cute little number today, based on the Megan, for a custom order that came through Georgie Love. Also whipped up this vintage plisse rainbow stripe wrap skirt for another GL custom order. I LOVE this fabric, and have been hanging onto it for quite some time. When the order came through last night with the following directive - "bright colours, pink, green, yellow, blue" - I knew its time had come. Add an extraordinarily bright (we're talking borderline flouro) 70s floral waist band and tie, some yellow bias binding and I'm pretty sure it's fulfilling the criteria.